From the first note of any Abelcain production the environment instantly shifts, stretching your limits of perception through his finely tuned sense of sonic ferocity. Ripping dancefloor tracks transcend their boundaries by becoming magical spells unto themselves. Abelcain desecrates the conventions of breakcore while adding a depth of both sound and context rarely found in the underground. 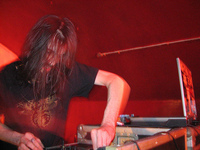 His works demolish the sound system with excruciating monstrosities of frequency and shattering rhythms. Besides his work as Abelcain, he has extended his output in various projects, most namely Davros, based off of the Dr. Who character. He has also appeared on the guitar and some drum programming on the debut release of Treachery.